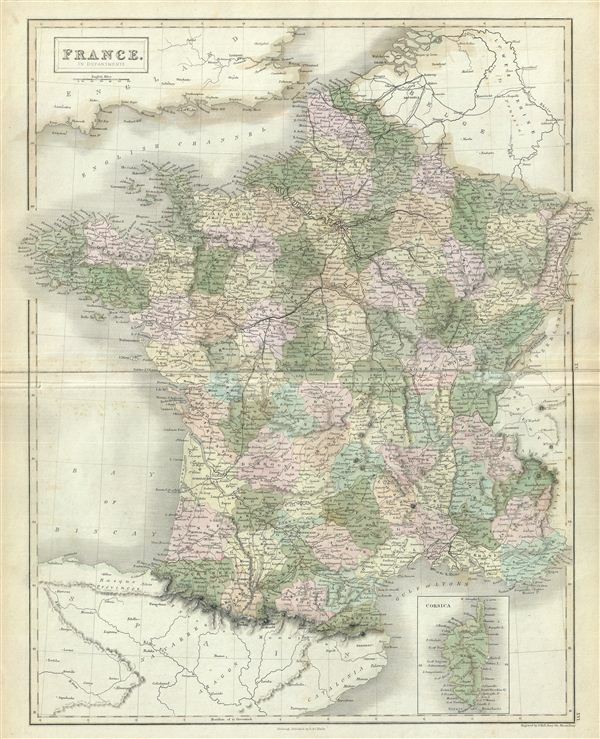 This is a fine example of Adam and Charles Black's 1851 map of France. The map covers France just prior to the December 2 1851 coup d'etat that brought about the Second empire. In less than a year, the Second Republic transformed into the Second empire, established by a referendum on November 7, 1852. President Louis-Napoleon Bonaparte, elected by the heavily Bonapartist French people, officially became Napoleon III, emperor of the French, from the symbolic and historic date of December 2, 1852. It covers from the Nord in the north to eastern Pyrenees in the south and from Finistere in the west to Upper and Lower Rhein in the east. An inset map near the lower right corner details Corsica. The map divides France into its constituent Departments. The French Department system was established on March 4th, 1790 by the National Constituent Assembly to replace the provinces with what the Assembly deemed a more rational structure. They were designed to deliberately break up France's historical regions in an attempt to erase cultural differences and build a more homogeneous nation. Initially there were 83 departments but by 1800 that number increased to roughly 130. Many of the departments that were created in 1790 remain the administrative districts to this day. Nonetheless, the province system was so engrained that most cartographers felt obliged to include two maps of France in their atlases, one showing the current department system, and another defining the defunct provinces. Various towns, cities, rivers, roads, railways, mountains and several other topographical details are noted with relief rendered by hachure. This map was engraved by Sidney Hall and issued as plate nos. XV and XVI for the 1851 edition of Black's General Atlas of the World. Very good. Minor overall toning. Blank on verso. Minor foxing and offsetting. Verso repair on original centerfold. Rumsey 2305.023 (1854 edition). Philips (atlases) 4334.